Home to Nicholls State University John Deere and the Rouses grocery chain headquarters Thibodaux is located at the northern part of Lafourche Parish at the convergence of some of Louisiana*s strongest local economies. Within miles of the Hampton Inn - Suites Thibodaux hotel you*ll find adventurous swamp tours historic plantations or depending on the time of year one of our outstanding annual festivals. 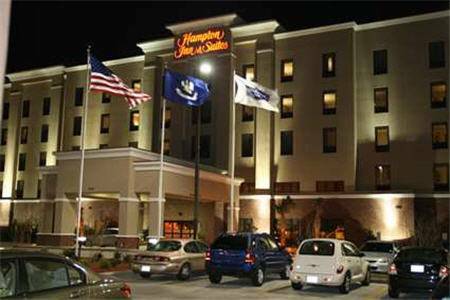 The Hampton Inn - Suites Thibodaux hotel which is located just minutes from Historic Downtown Thibodaux is just a short drive from Houma /13 miles/ New Orleans /68 miles/ Baton Rouge /69 miles/ and Lafayette /99 miles/. So whether you*re in town to drop your kid off at college visit authentic Cajun historical attractions such as Jean Lefitte National Historic Park or visiting one of our great businesses you*ll soon discover the Hampton Inn - Suites Thibodaux hotel is located in a community where yesterday welcomes tomorrow*. All reservations must be guaranteed with a major credit card or advance cash deposit to hotel regardless of time of arrival. ALL RESERVATIONS MUST BE CANCELLED BY 11:59 PRIOR TO ARRIVAL UNLESS DEPOSIT REQUIRED. Policy subject to change. - J. Ray McDermott Inc.
- John Deere Thibodaux Inc.
- NSU Chef John Folse Culinary Inst. The Atchafalaya Welcome Center featured a free show with realistic but singing animal puppet-robots: a raccoon, a loggerhead snapping turtle, and an alligator.